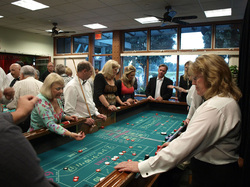 FANTASY CASINO has been producing casino events and poker tournaments for over 35 years. The hallmark of the company is an authentic casino experience with the benefit of player education, excitement, and enjoyment. The company consistently wins praise for its high quality image and style, without compromise, for all of the over 500 events per year it produces. The list of Fantasy Casino's clients is virtually innumerable. The staff of Fantasy Casino contributes hundreds of hours of consulting time each year to these groups. Each client of Fantasy Casino is encouraged to make full use of the time and knowledge offered by the casino party managers. Each organization has a different focus and a different set of goals. Fantasy Casino has built its reputation for excellent service on its flexibility and professionalism. Nothing beats the sights and sounds of a casino floor. People come alive, with energy. It's an exhilarating feeling with universal appeal. Fantasy Casino brings this fast-paced action to Southern California. Everyone has a love affair with Lady Luck. It's a fascination that ensures participation and a successful event. Whether you're a community Little League, a Fortune 500 corporation or somewhere in between, we've delivered results for hundreds of groups like yours. Throw your own casino party and hit the jackpot! There are many reasons to throw a party: personal celebrations, birthdays, anniversaries, showers. There's no denying the excitement created by the magnetism of the green felt. Make that excitement work for you. Do you want a dramatic way to break the ice among guests or just a reputation as a great host? What you're really providing your guests is an occasion to remember. You want them to leave excited and impressed. Fantasy Casino recreates a Nevada-style casino better than anyone. We reflect your best interests by providing clean, regulation-sized tables, friendly dealers who love to teach, and the hottest action this side of the state line. It's your casino. It's your image. "I don't have enough guests for a casino party..."
"My party's too big for a casino..."
How about a single table? And the largest ballroom in Los Angeles can't hold the thousands who attend our biggest event! With Fantasy Casino, you'll have an expert working for you. Our Event Manager will discuss every detail of your party with you. We'll even coordinate our activities with your caterer, site manager, or music people. Our commitment to your success starts with your first phone call. 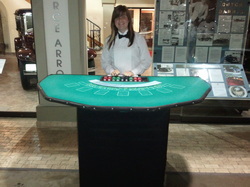 Call a Fantasy Casino Event Manager. Throw the plans for an oddly shaped room, boat deck, or patio on his lap. Give him a complicated schedule. Or a group of beginning gamblers. We'll show you how to make it all work. You provide the empty room, we provide success.